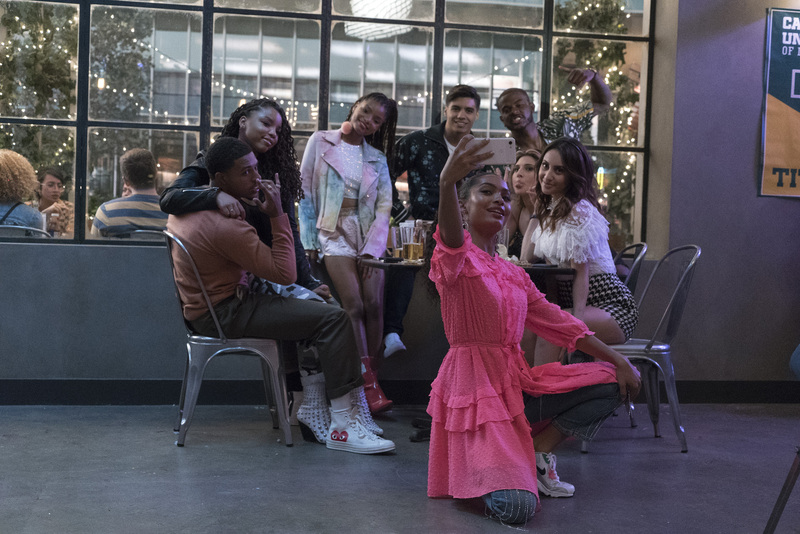 What went down on the latest episode of grown-ish? Get all the tea with Sesi‘s weekly recaps. For a generation that’s all about not conforming to the ways of old, Gen Z has hella new rules they’ve created for themselves — at least, according to Zoey. Her crew has rules against dressing alike, letting their phones die, and even mandates “good morning” texts be sent to everyone in said crew immediately upon waking. And that’s just the beginning. On 100, we’d be breaking those rules on the regular because they sound mad extra. A little later on, though, chillin’ at the kickback, Zoey spots Doug — Jazzless. And what does she do? Prepares to start drama while simultaneously saying she doesn’t want to start drama, which, of course, is doing too much already. Doug is legit not doing anything wrong, btw. He’s just choppin’ it up with another dude at the party, minding his very own business. But we all know our girl Zo, and she can never just let things be. Meanwhile, incoming on the group text: messages from Ana, Nomi, and Jazz saying they made it home safely. Jazz asks if Zoey’s good (she’s not), and Z looks to the camera for help on how to respond. Then, she glances back at Doug — who is again, not doing anything wrong — and then, back at the camera, lamenting, “This is bad. This is really bad.” It’s actually not, like, at all Zoey. But ok, the plot has to have conflict come from somewhere, we guess. Nomi and Ana say they need eyes on the situation to reevaluate, so Zoey sneaks in a few seconds of footage to send them. But, still no definitive decision has been made, and now, Zo is about to break her first squad rule of the night: Never let your phone die. This also means she can’t hit up her boo like she promised. Meanwhile, the cops show up to the party. They’ve received a noise complaint, and Aaron tries to talk himself out of a citation by appealing to their shared Blackness. They give him a ticket anyway. On her way to Luca’s, Zoey explains she’ll just tell him what happened with her phone and they’ll spend the rest of the night together. She knocks. He answers and says, “Dude, seriously?” (Luca, you should have seen her earlier!) Zo goes into his room and proceeds to give him a rundown of everything that just happened, while using his charger to resuscitate her phone. And then all the texts from Nomi and Ana start rollin’ in — 21 total. Luca is not here for Z messing up is vibe, so he tells her to “do you” while he watches TV with his headphones on. And with that, one last text comes through — and it says that Jazz knows. Everything. As Zoey makes her way across campus to her apartment, we find out what happened in the 20 minutes since she first spied Doug. After Zoey’s phone died mid-convo, Ana texted to ask if she’d made a decision and Nomi followed that up with a “Yeah, u don’t wanna piss Jazz off.” Thing is, Ana accidentally started this chat chain in the wrong group text — the one with Jazz and Sky — and when Jazz responds with, “Piss Jazz off about what?” We’re shook, they’re shook, and Zoey’s definitely gon’ be super shook. Back from that flashback, Zoey has returned home and starts going off on Ana. Then, Jazz pops up from the kitchen demanding an explanation. Zoey tries to say she didn’t let her in on the other texts because Doug wasn’t doing anything wrong, and she didn’t want to cause any unnecessary drama. “You don’t think going behind my back, texting about me for 42 minutes is drama?” Jazz asks. If you’re thinking how oddly specific that is, you’re right. Turns out, Nomi sent Jazz a screenshot of the whole interaction. These girls out here breaking hella rules on each other, for real tonight. The drama is just getting started, though, because as Jazz continues to drag her girls for not having her back, Ana puts her on blast and shares that Jazz started a different group text about Zoey just the other day. Words are exchanged and they all start arguing with each other. Jazz blames Zoey for it all. She’s not wrong. Zoey storms off and goes to bed, another one of her voiceovers playing in the background as she lies there. How did this one kickback get so blown out of proportion, she muses. (Girl, you.) Zo tosses and turns all night, and when she wakes up the next day, she receives not one “good morning” text. Deciding to be the bigger person, she sends one out to the crew. No one answers. Back with Zoey, we find out in addition to no “good morning” texts, her girls have also all logged off location tracking. On her way to class, though, she runs into Sky, thinking she still has a friend in her. Wrong. Sky is loyal to her sis, regardless. Standing in the doorway of her class — a class she has with the twins and Ana — she sees they’re all giving her that mean girl stare, so she bounces. As she’s leaving the area, Luca calls, but her phone is dying — again. She runs around begging strangers for a charger, but no one helps her. She collapses in a stairwell all dramatic like. Next thing we know, Zoey is laid up in the campus health center, recovering from an apparent panic attack. Then, in walks Luca — or, as the nurse believes, Zoey’s “identical twin brother.” Since she didn’t answer his calls/texts again, he tracked her on the location app. (How he did that when her phone battery is dead? Yeah, we don’t know either, but just go with it.) She catches him up on what went down since last night, and he delivers that good, wise word, per usual. Later, at her apartment, Zoey hops back in the group text to apologize to everyone. Ana and Nomi accept right away — Nomi even says her own, “I’m sorry 2.” Sky says she’s trying to take a nap. And Jazz? She just blatantly exits the group. This can’t be good. Welp, until next week! Catch up on the episodes you’ve missed here.